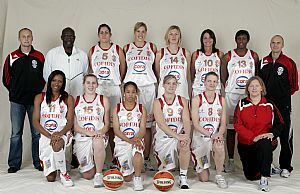 Gambrinus came to France and walked away with their first victory of the EuroLeague Women 2008-2009 season (67-63). They did the damage with their three-point shooting. Eva Vitecková led the way with 22 points including 4-of-9 from beyond the arc. Hana Horáková with 17 points also managed to hit 3-from-8 from beyond the three-point line. Zuzana Zirková was the other player in double digits with 10 points. 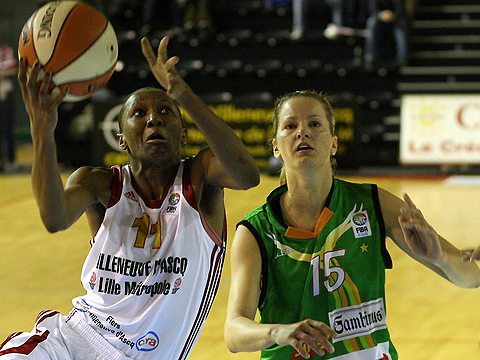 Géraldine Robert and Ljubica Drljaca did all they could with 17 and 16 points each. But without Fatimatou Sacko they were short of fire power. They were also powerless in stopping their opponents from scoring from beyond the arc. Jolene Anderson and Florence Lepron also finished in double digits with 12 and 10 points apiece. The visitors from Brno Gambrinus were quick out of the firing blocks. With Petra Kulichová scoring and then Eva Vitecková landing a shot from beyond the arc they led (5-0) with just over one minute played. Villeneuve d'Ascq took their time to compose themselves. Florence Lepron started to run the plays and fed a pass to Ljubica Djljaca who hit a shot from beyond the arc. Afterwards Villeneuve took over and with Géraldine Robert all over the court they went to score 10 more points to go ahead (13-5). Gambrinus, pushed by Vitecková and Hana Horáková came storming back to reduce their deficit to 2 points (13-15). Thereafter the two sides traded basket for the rest of the first period with Djljaca scoring the last points. This allowed Villeneuve to lead (21-17) going into the second period. Tamika Whitmore, playing for Gambrinus, opened her account with the first points of the second quarter. Both teams tightened up defensively and stopped scoring. The guests' patience was rewarded as they regained the lead (22-21). Whitmore concluded a fast break with three minutes played in this quarter. Horáková stretched the Gambrinus' advantage as she hit her first three-pointer of the game. Robert ended Villeneuve's barren spell. Yet it was Kulichová restoring Gambrinus lead (27-23). Robert and Djljaca were to bring Villeneuve back on level terms (27-27). However the last three minutes belonged to the guests as they fired in four three-pointers to go into the interval leading (36-29). Jolene Anderson scored the first points after the interval by hitting a three-pointer. It appeared that Villeneuve were willing to take extra risks to get back into the game. Despite the efforts of Lepron, Gambrinus stretched their advantage (42-34). Yet a second three-pointer by Anderson got the hosts going again with also Lepron scoring from beyond the arc. Villeneuve's deficit was just 3 points (42-45). Gambrinus held their nerve and went into the final quarter leading (49-46). Drljaca opened the scoring in the fourth quarter as Villeneuve went all out in attack. Then Villeneuve went in front briefly as Robert hit a couple of free-throws 30 seconds later (50-49). A three-pointer by Vitecková put Gambrinus back in front for good. By the time Gambrinus added three more three-pointers it appeared that it was all over for the hosts (63-54). Villeneuve rallied back and with 90 seconds left to play they trailed by only 4 points (63-67). Yet neither side was able to score during the remaining time.